Profile: As a child, Nina would covet her grandmother’s button box. It contained an eclectic collection of lovingly gathered bits and pieces. Not just buttons but also a loose assortment of brightly coloured glass beads, tokens, broken paste brooches and seashells. As a jewellery designer maker, Nina now casts as wide a net as possible to source her own varied and constantly changing collection of new and vintage glass beads, freshwater pearls and trinkets from around the world. 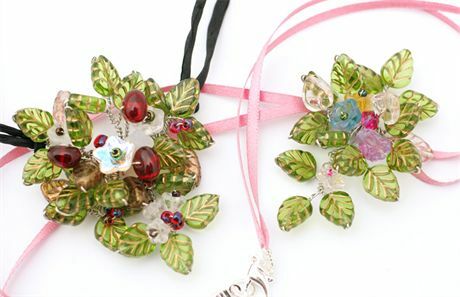 She then uses these finds to create her unusual but highly wearable jewellery items. Styles range from bold contemporary pieces through to delicate garland necklaces constructed from twisted wire and glass. Inspiration for much of Nina’s work comes from the gardens, hedgerows and coastline around her home in Dorset. She loves the capacity that colours have to evoke a memory or mood and strives to capture the essence of what she sees, whether from a glimpse of a cottage garden down a country lane, striped deckchairs on a summer beach or the fresh vivid green of the first buds in the hedgerows on a cold spring morning; all these are overriding passions. Since setting up her studio in late 2004, Nina has enjoyed phenomenal success, with her work exhibited and sold at many of the most well respected galleries across the UK.